i found this book at a yard sale recently. well, actually it was a park sale because it was located in a park. the book was a little tattered already and it cost something like 50 cents and it was perfect that i had it already. it doesn't say so on the cover but it's "Märchen" by Astrid Lindgren. i have a newer edition of this collection of tales - i got it for my birthday when i turned 8 or 9 i think. i inked the edges of course... and i filled the cover with four new signatures of junk. i managed! i had been wanting to do that with a nice book cover for ages and somehow i got scared whenever i thought i wanted to do it but now i finally did. not all the papers have the same size and many of them have torn edges and creases. there is a chocolate wrapper in there too. the sun, moon and stars papers came from another work in progress when i enthusiastically started stencilling away and then realised i had some measurements wrong... well, nothing goes to waste! i put in the negative-piece of a butterfly-die-cutting-session. i just love all the butterfly shaped holes in the paper. the text is columbian and actually about butterflies which i didn't know when i cut them. i love it when that happens. i have started decorating it more already. i'm using the leftovers from the papers i used for the pages to make tuck spots and pockets and i'm adding the illustrations and some text from the book too. i know some people would probably say something like: "why cut up a perfectly good book?" and "how can you do such a thing?" and the truth is that it wasn't easy at first and i had to get used to it. i was taught that books were something precious that need to be handled with care when i was little. and i still believe that and i teach my kids to take care of books too. i would never cut up a book that is brand new (unless it's really crappy and deserves it and has an awesome cover) or one that is of great value, be it antiquarian value or sentimental value. apart from the fact that the visual art (by Dave McKean) is just beyond any kind of praise i'm capable of phrasing other than "ahh... oh... baff... WoW!" maybe throw in a dry sob of envy... the stories are just so perfectly clear and closed in themselves, leaving nothing open even though they are about impossibilities. 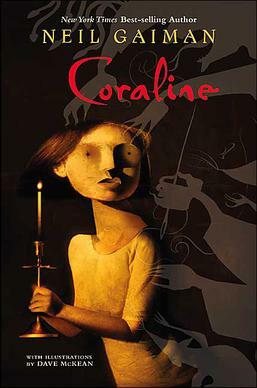 "coraline" too i find delightfully out of this world - both the book and the gobsmackingly brilliant stop motion movie - as well as "stardust", a graphic novel Neil Gaiman wrote with the illustrater Charles Vess in a kind of symbiosis between text and image, one inspiring the other and vice versa, not just one way. but still Michael Ende and Neil Gaiman were/are both great wordsmiths and a beautifully executed story hardly ever fails to catch me - Jane Austen does that for me too and she did not in the least write fantastic as in fantasy. so what is it about surreal images and pictures that i find so alluring...? and actually i don't mean surreal as in the surrealist movement of the 1920s. i don't know a lot about how these artworks are created and honestly i'm not all that interested... don't get me wrong - i would love to know how to create this kind of art myself but when i look at and enjoy it i don't need to know how it's done, if that makes sense. i spent a considerable amount of time studying "twin trees market", enlarging it as much as i could so i could find all the details and the secrets hidden in it... i love the thought that the artist while creating this scene knew exactly who these creatures were and what they were doing... and i think mr. jansson does know. i'm not entirely sure but i think this image is part of the "ramone bosco" graphic novel which has unfortunately been postponed. this one i found recently and these too. Modestas Malinauskas' skil and talent is obvious but it is so much more than that which makes his paitings so wonderful. anyway - i looked at Modestas Malinauskas' paintings and almost started crying with a mixture of utter joy and entrancement and incredible sadness and frustration. it's not that i'm jealous of other artists' work - apart from the occasional annoyance with my own work not turning out the way i want it to. i know that's only a matter of practice and training... no, what i envy is the fact that they seem to have access to the place within themselves where all this wonderful imagination comes from. when i see images of flying houses in clouds, villages growing on an elephant's back or on wheels finding their own way, impossible treehouses, people harvesting fruit twice their size, hovering lanterns with wings and their own umbrellas, weird creatures just being there without any "why" or "how" and so on and so forth - and when these images are so very well done on top of it - my brain goes like "why can't i think of that?" i know these blue stars and the moon may not look like much to most people but to me they are a sort of symbol of breaking through a barrier built up by my own brain years ago. when i was thinking of a colour to use i instantly reached for that blue (faded jeans distress ink) and then i put it back saying to myself "you can't make blue stars - stars aren't blue" and then i grabbed it again thinking something along the lines of " yes, i can make blue stars - this is my f***ing journal and i can make blue stars if i want to!" who has ever captured the true colour of stars as they appear on a night sky on paper or canvas anyway...? "what do i do with it? - what is it good for?" i hate that thought... it ruins everything and i have to fight it pretty much on a daily basis. "do i put a butterfly here? yeah, that looks pretty. but does it have any purpose there? no, not really - it's just sticking there looking pretty. well if it's not good for anything then let's not put it there... but it looks pretty... but why should it be there just to look pretty? can't it at least have a purpose like holding a tag or something...?" that's the sort of thing that runs through my head most of the time while i'm working on books or journals - which are what i work on most at the moment. i do a little mixed media art on canvas sometimes, i occasionally work in my art journal and i make extravagant and time consuming cards as gifts because i usually can't afford a "better/bigger" gift... but making books and journals is my true love and with that i feel like there is more of a purpose to it than there is to pretty decor pieces that sit somewhere and collect dust - nothing against that though.